I’m posting this bike in the knowledge that it’s going to polarize opinion. Blitz’s first appearance on Bike EXIF was just under a year ago, with a blacked-out BMW R60/2 that attracted tens of thousands of hits. The R60/2 also enraged many commenters: ‘This is just an old bike painted flat black with completely wrong tires installed,’ said one professional bike builder. So I present for you here, with a completely open mind, the latest moto from Fred and Hugo’s workshop. 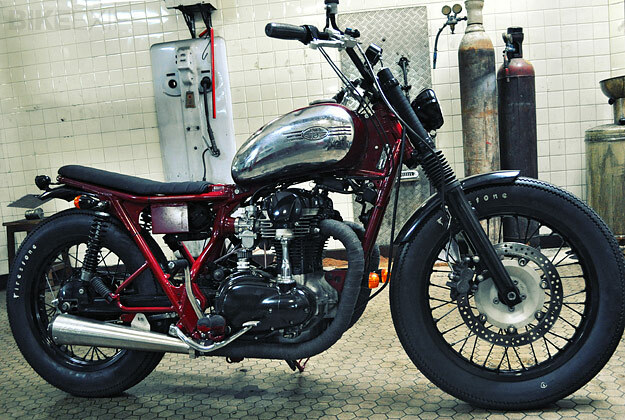 It’s called ‘Gentle Tracker’ and it’s a thoroughly rebuilt Kawasaki W650. 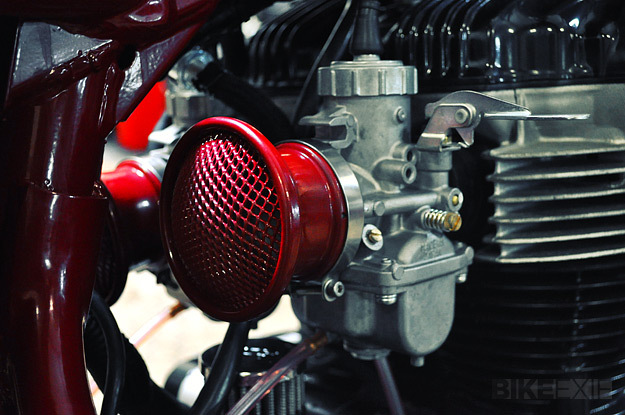 The frame has been powdercoated in gloss red to match the color of the tank, which is from a Jawa CZ350. 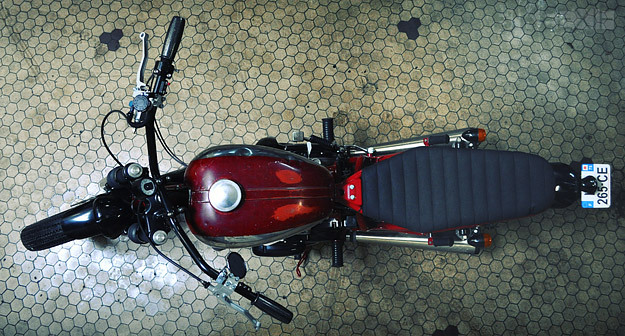 (The owner of a company called Jawa Productions commissioned this bike.) Blitz have upgraded the motor with Mikuni VM34 carbs and K&N air filters, plus Supertrapp mufflers to help it breathe more easily. The seat, battery box and rear fender are all handmade, and the front fender has been chopped and powdercoated. 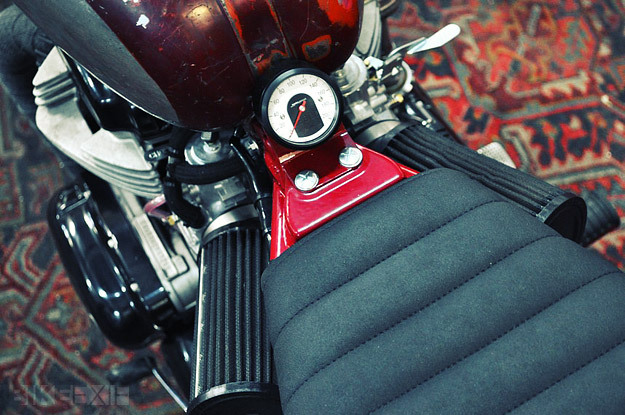 Blitz also lowered the Kawasaki W650 by 1.75 inches and fitted Hagon shocks to improve handling. 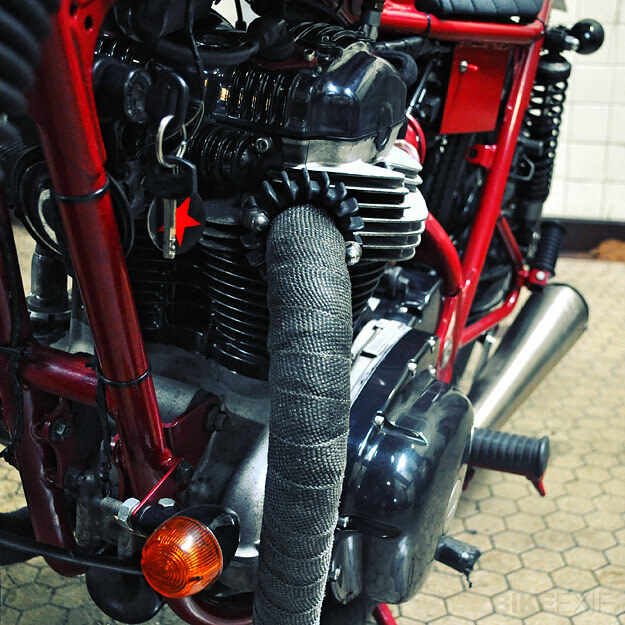 Micro switchgear was installed on the Triumph T140 bars (the black glitter grips are from Posh) and the simplified electrical system was hooked up to Bates-style lights from Japan front and back. I’m inclined to agree. Do you? Visit the Blitz Motorcycles website for more information.